Dark Gums – Can They Be Changed? What Causes Dark Gums and Can They Be Changed? 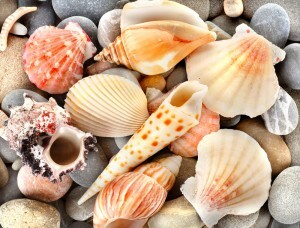 Many patients wish they had a smile that includes pearly-white teeth and coral pink gums. A lot of people are self-conscious about having darker gums. Gums can even have a mottled color pattern. What causes gums to show up in darker shades? If this bothers you, what can you do about it? Gum lightening here at Chrysalis Dental Centres could help you achieve your dream smile. Can this procedure benefit your gums? Find out more by investigating what causes black gums. Did you know that your gums contain pigment just like your skin does? Just as skin colour comes in a variety of shades, gums do too. It’s even possible to have speckles of melanin on your gums, just like freckles! 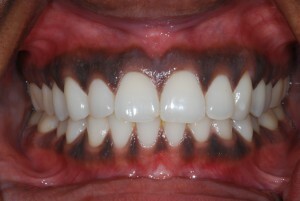 There tends to be a higher level of pigment in the gums of individuals with darker skin. If your gums are dark because of genetics, then you don’t need to be concerned. They can be dark and perfectly healthy! 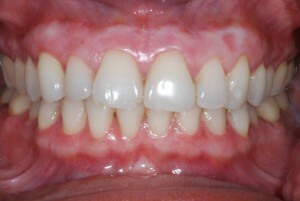 But if you want the classic pink look, pigmented gums can be safely lightened. Some external factors can affect the colour of your gums. The medication you take can alter your gum colour. Smoking also plays a big role in changing how your gums look. If you want to change the colour of your gums, you might need to limit the factor that coloured them in the first place. Talk with your doctor about possibly changing medications. Now is a great time to cut out smoking! Quitting will help your gums recover from the procedure and keep their lighter colour. Sometimes, the cause for darkened gums comes from within. Discolouration could be a sign of a serious form of gum disease. Gum disease can occur in an acute form. This results in the gum tissue dying at a rapid rate. If oral disease is what’s causing your gums to look unhealthy, then they are unhealthy! Before you can correct the colour, you need to address the problem at its source. Gum bleaching or lightening is actually a surgical procedure, not a chemical one. A skilled gum specialist will treat you while you are numb with a local anesthetic. Sedation is also available if you are generally nervous at dental appointments. The Chrysalis Dental Centres team believes that all smiles are beautiful! But you may want to express your confidence and style by redesigning your smile. If that’s the case, consider gum bleaching! Schedule a visit with our team at Chrysalis Dental Centres. Find out what causes black gums by having a personalized consultation. We’ll help you find a solution for dealing with this common problem. We look forward to meeting you! Call us today to schedule your appointment. This entry was posted in Periodontics on June 1, 2016 by Dental Implants 123. What are the important differences between conventional dentures and implant supported dentures? Conventional dentures are designed to conform to the shape of your mouth. Your gums and the underlying bone structure support these dentures. The dentures rub against your gums and often create sore spots. Many people feel that a traditional denture is the best option for replacing teeth. These dentures are removable and cleaned outside the mouth. An implant-supported prosthesis is a denture, which is both retained and supported by four or more dental implants. This means that the denture does not rest on the gums. Rather, it is fixed on implants, which are embedded in bone. Only your dentist will remove the denture for cleaning and examination. Other than that, it stays inside your mouth for life. So, does it matter which denture option you choose? Consider how the differences affect performance. The fact that regular dentures rest on top of the bone and implant dentures do not plays a big role. This is because they affect the bone in different ways. Regular dentures rub against the gums. Especially in the lower jaw, they have nothing to hold them in place and they are difficult to chew with. The bone shrinks because there are no teeth or implants to stimulate it. Implant-supported dentures draw strength from the bone. The dental implants that support these dentures are embedded in the bone. This prevents them from slipping and gives them added strength. They do not create sore spots from rubbing against the gums. Dental implants stimulate the bone and, as a result, the bone is far less likely to resorb or shrink. Conventional dentures do not stimulate the bone. The jawbone will shrink and the shape of your mouth will change. This means that the dentist could have to regularly adjust the denture to fit the shape of your mouth. The lining of the denture sometimes has to be changed to address the sore spots. Implant-supported dentures aren’t meant to rest on the gums. Instead, the bone anchors them in place. The implants promote bone strength and help prevent the bone from shrinking or resorbing. What Is Your Long-Term Choice? Traditional dentures may seem like the best option based on cost, alone. How do they pay off in the long run? The need to have them adjusted can become a burden. You could also suffer from a change in the shape of your smile. Many conventional denture wearers are embarrassed to eat in public. They often avoid social situations. They are afraid to go swimming because they may lose their teeth and not be able to find them. It is hard to associate a cost to this behaviour. Many people agree that implant-supported dentures are the wisest long-term investment. Why? Because an implant-supported denture can help to preserve the existing bone for a long time. Also, it can give more strength to the bite and enable you to eat the foods you love. Implant-supported dentures need far less maintenance than regular dentures do. For some people, the most important benefit is a huge gain in confidence. Weigh the facts when considering conventional dentures vs. implant supported dentures for replacing missing teeth. Learn more about how an implant-supported denture is right for you. Make an appointment with Chrysalis Dental Centres today! This entry was posted in Implants and tagged Implant Supported Dentures on October 27, 2015 by Dental Implants 123. What are Ceramic Dental Implants? Ceramic dental implants are an alternative to our widely used titanium dental implants. Ceramic implants are made of highly durable zirconia. Zirconia is a strong material that can withstand biting forces. It is also aesthetically pleasing, as it is tooth coloured. In areas such as the front of the mouth, ceramic dental implants can be beneficial. This is especially true if there is a small margin around the actual prosthetic teeth. A metal (titanium) implant sometimes poses aesthetic concerns. If the implant is visible when you smile, this could cause a grey shadow around the tooth. Using ceramic implants can solve this problem. A ceramic dental crown or bridge will have a thin margin between the prosthesis and the gumlines. If a ceramic dental implant were to show, the color of the implant would look more natural. In certain circumstances, this may allow the titanium implant to be seen. While this is not a problem in the back teeth, it will be if it affects the appearance of front teeth. You might be asking yourself “is ceramic safe to use for my smile?” Absolutely. Dentists have used ceramic for restorative, prosthetic and aesthetic purposes for years. Ceramic is often used to make custom crowns, dental bridges and even some types of implant dentures. Using ceramic as an implant is just a further extension of the material’s capabilities. At Chrysalis Dental Centres, we can offer white ceramic dental implants to our patients. The actual ceramic implant is white…similar to the replacement crown or bridge. This can improve the overall aesthetic approach to your smile rehabilitation. It may take our cosmetic dental implants a step further in your smile makeover treatments. Unlike titanium implants, ceramic dental implants have a built-in abutment. This fused abutment is the implant extension that supports the fixed prosthesis. The one-piece body design eliminates extra steps needed during the implant treatment. It also discourages extra bacterial growth. The ceramic body is allergen-free and biocompatible with the body. Just like titanium implants. Ceramic is also corrosion resistant. With a rigid root design, ceramic implants are also well supported by your tissues. Your ceramic dental implants can support any fixed crowns and bridges. Once the custom prosthesis is bonded to the implant, the final appearance looks more lifelike. You will not have to worry about dark grey lines along the gums. Even if you suffer from gum recession later on, only a white implant root will be seen. This feature assists the implant in blending with your smile. All you will see is a fully white tooth that closely resembles the appearance of your other teeth. Are you avoiding dental implants because of the metal that is used? Do you worry that a titanium implant will interfere with your appearance? Are you extremely sensitive to metals? Ceramic dental implants may be an excellent option for your smile. Call Chrysalis Dental Centres today to schedule a consultation with one of our dentists. Find out how ceramic dental implants could change your implant experience. Call 1 888 733-6983 for a no-hassle, no obligation consultation to determine if you are a candidate for one of our dental implant solutions. This entry was posted in Implants on July 6, 2015 by Dental Implants 123. Gum Bleaching – Is it for you? If you have very deep pigmentation or discoloration of your gum tissues, it can interfere with the appearance of your teeth when you smile. Even if you have beautiful straight, white teeth, discoloured gums may take away from the overall affect that you’re looking for. That’s why, at Chrysalis Dental, we are committed to addressing your entire smile – not just part of it. Our gum bleaching techniques remove deep tissue pigmentation. How Do You Get Dark Gums? 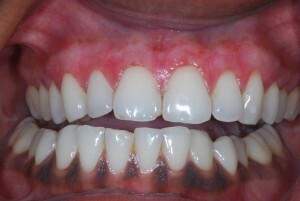 Gum bleaching, lightening and depigmentation techniques take the naturally dark color of your gums and make them look pinker. We give you gum tissues that look pink and coral. There is absolutely nothing “wrong” with dark gums. This is simply an elective procedure for those people who have dark gums and would prefer to make them lighter in colour. Your gum bleaching or gum whitening takes about 30 minutes to complete. Minor gum whitening can be done with a bleaching solution, but more deeply pigmented tissue uses a process similar to microdermabrasion to compliment the process and offer more dramatic results. First, the gum tissues are numbed to prevent any discomfort. You may also want to consider sedation for your visit, if you feel nervous or are worried about how the process will feel. Even though you will not feel any discomfort during the procedure, some people still prefer to simply “nap” right through it. Since the pigmented layer of tissue is superficial, buffing it away will reveal lighter, pinker gums underneath. As we buff the gum tissues we may also need to apply a solution to create a more even color appearance. As your gums respond post-operatively to the procedure, they continue to remain a healthy pink color, without pigmentation coming back. That’s right – your results last for life! Following the procedure it is normal to experience mild discomfort for a day or two. However, most of our patients return to their normal schedule immediately after their appointment. It will not interfere with talking, smiling, or the way your teeth feel. Even if your teeth look absolutely beautiful, some people think that their gum tissues can take away from their smile. Healthy looking gums are one of the best accessories your smile can have. Know whom to trust. At Chrysalis Dental Centres we’ve helped hundreds of people lighten the colour of their gums with our gum bleaching procedure. If you dislike the way your smile looks because of dark gums, it’s time to give Chrysalis Dental Centres a call. Learn more about gum bleaching Toronto. We’ll arrange a time for you to meet with our Periodontist to determine whether or not gum whitening is right for you. Don’t wait another day. A healthier looking smile is just a visit away! This entry was posted in Periodontics on June 16, 2015 by Dental Implants 123.